Over the years we receive many kind words from our customers. Here are a few user comments we have received. “I live in the UK. I own two of your bass cabs, a Q10BX-D and a D10BX-D. I have recently put my James Demeter pre amp and Crown power amp into an 18mm birch-faced ply sleeve I built myself and want to cover it in the same deep red carpet as the cabs. I am using this equipment at a festival on 23rd July. The sleeve is the same width as the cabs , 22.5 inches deep and 12.5 inches high. Please could you sell me sufficient of your Deep Red carpet to cover my sleeve? If so how much would you charge me and are you able to ship it in time for the 23 July? The shipping in this time is not critical, but it would be great if you could. “I purchased my first Bag End Speaker (S15X-D) in 2000 and it is still going strong. Not only do you make a great product, but you stand behind your warranty and provide great service. Several years ago, I purchased an S12-D to attain a nice, warm mid-range tone for use in a trio situation, which provided ample flexibility at a moderate volume level. Recently, I discovered that the Speaker had no output. After contacting Bag End by phone (no such thing as voice mail here…real people always answer the calls), they immediately shipped out a replacement unit, advised me to use the original packing to return the defective speaker, diagnosed the problem and subsequently informed me that it was under the 6 year warranty and that no charge would be incurred for the replacement speaker. Amazing, but not surprising for a Company with their impeccable reputation. 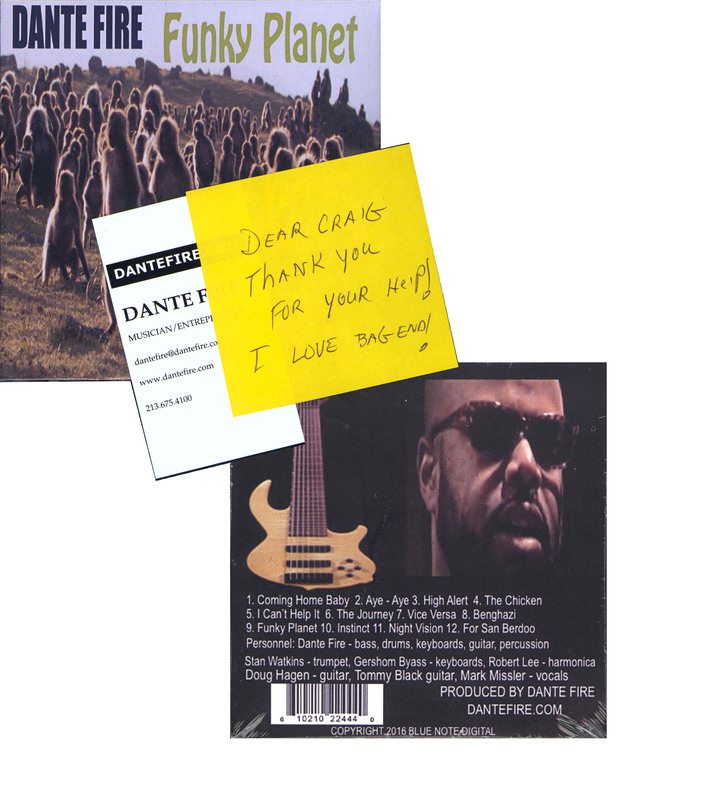 Dante Fire uses Bag End D10X-D and Q10X-D musical instrument series cabinets. In 1980 my band was just getting rolling and I needed a powerful, yet portable speaker cabinet to carry my sound as a bassist. I had a great amp, a great bass but the speakers I was using at the time were weak and lacked low end response, or were too large to easily transport to small and medium size gigs. My local music store in Barrington, IL, no longer in business, suggested I visit the Bag End factory, which was located in Barrington at the time. Long story short, I walked out with an S15-B enclosure which featured the Bag End designed 15 inch driver. A simple yet powerful little box full of sound. The enclosure has survived over 1000 gigs and has always been stored in the trunk of my car in all types of weather conditions. It has never been ”babied”. Some would say it’s been mistreated. The cabinet has never let me down, always sounding gutsy and delivering the full range of tones I send to it. Over the years I have purchased other high end speaker cabinets for larger gigs, but when I need a powerful sound in a small space it’s always the Bag End 15. Yesterday I decided to bring my nearly 40 year old Bag End speaker back home into the Bag End factory, now located in Algonquin, IL, for a checkup. Craig the lead tech at Bag End smiled when he saw it, like one of your kids coming home from college. Although it was slightly different from their current offering, it was nevertheless the same, oiled birch plywood cabinet with Bag End designed 15 inch driver. The changes over the years have been small and incremental. Note the original T-wrench, that used to ship with the speaker, attached to the speaker magnet. I had expected after all these years I might need to replace the driver for improved response and overall sound. After Craig ran his series of tests on the driver, A/B comparing it to the new, current version he told me it really wasn’t necessary. 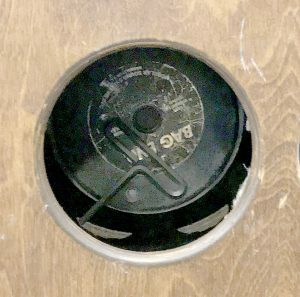 The nearly 40 year old speaker tested and sounded nearly as good as the day it left the factory in 1980. My S15-B cabinet has been driven with amplifier heads ranging from 100-300 watts over the years, and it has not been babied, it has been pushed hard. This day and age there are only a handful of products that stay true to their roots. When the original design is right it does not need to change year after year for the sake of change. My Bag End is very much like the time tested Volkswagen Beetle design which very slowly evolved over the decades in the US, never changing for the sake of change alone. Here’s the bottom line, If you are looking for a speaker cabinet and driver that will stand the test of time and heavy use go with Bag End. As the years go by you will never be second guessing what new design from someone else might be better. Quite simply it will not be better, only newer and in my book newer is a gamble. Bag End is not a gamble but a reliable old friend that projects your sound day after day, year after year. And the key here, it never gets old, just a few battle scars adding to it’s true character. Thanks for making a product that never grows old and is as reliable as any you can buy. Simple and time tested craftsmanship that always delivers your sound. I wanted to let you know that I am very impressed with the sound of the 15″ coax bass bottom that I bought used 2 years ago. There is no doubt in my mind that using your bottom has helped me to gain entrance into several working groups along with being a contracted player on occasion. No matter what gig or practice that I go to it never fails that the other players and audience members can not believe the sound and great clear low end that comes out of this compact cabinet that can fit in the trunk of my grand prix. I am driving it with an inexpensive 300 watt Behringer transistor head which knocks off an ashton. I have also driven it with my old ampeg v4b 100 watt tube amp and the Bag End bottom consistently delivers great tone quality, especially for blues, funk & R&B. The Bag End blows away my other bottom that is a GK twin 10″ with a tweeter and it is much smaller. I can not fit the GK bottom in my car trunk. I have very rarely had to use both the bottoms since purchasing the Bag End. When I purchased it, I emailed Bag End for an emblem that I put on the grill as the guy I bought it from took it off. I hope that I have influenced other players to buy Bag End products as I was when I initially heard it. When and if I buy another speaker bottom it will definitely be a Bag End. Keep up the great sound. This year I acquired two Bag End Deep Red Series S10-D and S10X-D. Like the Claritin commercial where they peel away the haze to reveal crystal clarity, the sound is like no other speaker I’ve ever owned or auditioned. “I recently bought a pair of TA1200’s, as I had played hundreds of gigs on these speakers in 2 other bands over the last 11 years and they always sounded great. While waiting for my order to come in my sales rep mentioned that there was some delay do to the fact that the speakers recently went through some redesign. I was NOT happy to hear this, because in this day and age this usually means finding some way to cut manufacturing costs and generally results in an inferior product. Last year I decided it was time to seek out the best bass cabinets on the market. I did a huge amount of research and surfing, talked to bassists and listened to live rigs, and finally decided to go with the product brand and sound that came up most frequently…Bag End. Once I was in the Bag End “store,” and studied their inventory, I decided that I needed the Q10BX-D cabinet (actually, I did a Wayne’s World …”Oh yes, you will be mine,” kind of thing). Not being one to skimp, I bought two for my live rig. I have since been told that I am crazy because no one really needs 2 of these cabinets, but I disagree. Everyone should have 2 of these beauties (especially if you have roadies). I hooked them up to a 1600 Watt Ampeg head and felt the power through my bones. Oh Baby….the thunk is poetry delivered from a sledgehammer. I have never been happier with ANY speakers I have ever owned since I started in the business. I have 100% confidence in the Bag End product and have never received more complimentary comments from musicians, sound technicians and audiences. I frequently notice technicians standing in front of my rig with an admiring glow. I silently nod to them in knowing recognition. No words are necessary. This is Bag End’s reputation. Kinda cool. I can’t imagine ever needing or wanting a different speaker configuration than the Q10BX-D’s. I believe they can handle ANYTHING I slam out…. and I have been known to get brutal at times. I think they deserve a lot of credit. Their customer service and sales staff were extremely competent, terrific, friendly, helpful and they also laughed at my jokes. Thanks Bag End for having terrific products and a great company. I finally got the S15B-D bass cabinet last week. I didn’t get a chance to play in a big enough room to use the cabinet with my S15X-D…until tonight. I played one of the best clubs in Tulsa, Oklahoma. Some of our regular fans came up to me during a break to ask me about my bass. They were all telling me (musicians and non musicians) how great my bass sounded! Two bass player friends of mine heard about my new set-up with the Bag End cabinets, and had to check them out. By the way, they both bought the S15X-D cabinets since they heard my Bag End cabinet three months ago. When I added the S15B-D to my rig, it was like magic. My girlfriend and my band mates were amazed how the sound filled the room without being too loud. My upright bass filled the room without booming and sounded like my bass. It had enough volume to be heard and felt without being overpowering. It is the perfect bass rig, my Ampeg SVT-3 Pro amp, and the S15B-B and S15X-D Bag End cabinets. I also played my Fender Jazz bass tonight and it also was incredible sounding. You could hear every note with even volume on all strings. I don’t know if I’ve ever gotten such a good sound out of both my Fender and my Engelhardt Swingmaster double bass. All in all, the new cabinet was a definite compliment to an already great sounding bass rig. I started playing bass in 1965 when I was 13. In all the years of playing, touring and recording, I have used about every good bass rig on the planet. Nothing compares to what I have now, thanks to Bag End! I don’t know how you guys at Bag End do it, but I am a loyal fan and customer forever! You have solved my bass cabinet problems for good. We also use an 18″ Bag End subwoofer cabinet for our P.A. I’ll have to send you a picture of my bass rig, it even looks cool. I can’t thank you enough for all your help and recommending the S15X-D!!! “I recently purchased 2 sets of Crystal-R’s from Scott at Starsound Audio in Reno NV. 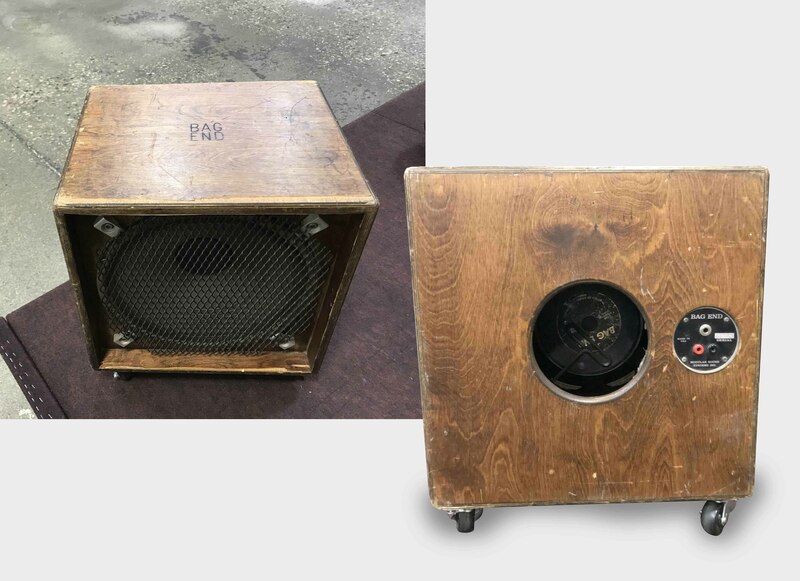 Scott had used these speakers for production of the Reno Air Races and Hot Air Balloon Races. I purchased them as I wanted to move into a more professional level with my equipment. I finally got the chance to see what these speakers would really do at the Lassen High graduation ceremony in Susanville, CA. This was an outdoor event covering a football field filled with parents and students. The Crystal-R’s were amazing. A friend told me that he could hear the pre-ceremony music 3 blocks away!! And, due to school direction, the speakers were sitting ON GROUND LEVEL. For visual reasons, they would not permit me to elevate them. Hello, My name is Matt Rubenstein and I’ve had business to business dealings with you guys, and have broken bread with Jim Wischmeyer. I also happen to own an infra sub 18 and have loved it to death for about 10 years. I was scanning the website of a well known taoist master, Mantak Chia, and came across the following quote and wanted to share it with him. Please forward it on to him and wish him the best from me. I hope he gets a kick out of it! Hope all is well with you guys. Take care. I’ve been playing the Low Down Dirty Blues for 40 years www.meninblues.net and hand building fine Hi Fi loudspeaker products for over 20. From experience there is nothing that touches the Bag End 10 inch drivers for faithful reproduction of demanding low frequency requirements of the 5 String Bass Guitar with such power and authority. It’s truly amazing how well two 10 inch drivers can cover most any club application in one solid but compact cabinet. The flexible inputs give me the ability to series parallel multiple cabinets to meet the required impedance characteristics of any amp on the fly for outdoor shows without lugging huge PA subs. Thanks for this fine American Made Product. Here is the tale of 2 wet events, and thousands of hours of great music listening. I bought the sub for 2 channel music (and some occasional morbid home theatre curiousity). The first day I got the sub and added it to my 2 meridian dsp 5000’s I played Toto Kingdom of Desire, then straight to On Every Street Dire Straits, then 4 or five hours later Some Bruce Cockburn…..HOOOOOOLLLY SHEEEEEEEEEEEET. It was the most musically satisfying home listening I had encountered!! It blended so beautifully, it was like the speakers just became painted together …amazing. I play drums and there is nothing more satisfying than a great chest soul punching kick drum……. and now I finally had at home what I usually had in my Meyers monitor rig on stage … that danmar wood beater smacking a coated emp shaking your dinner loose ! Our house on the Cumberland River is submerged by the flood, my wife and daughter escape the attic in zodiacs after a six hour huddle. I finally get back into the house 7 days later after the river subsides….. my sub had floated thru the house from its dedicated spot, thru the kitchen, past the dining room and finally landed in the living room area ….the screen wasn’t even torn as my family and the rest of Nashvilles wonderful volunteers helped clean up I found all kinds of excuses to never let the sub get tossed. Finally in July, I pushed the sub up against the front door to hold it in place and we moved on to our next home up in Ky. I would get down every few weeks to check on the house, the sub sat thru a whole winter and finally in July of 2011 we were going to have the house demolished… there was my infra sub still proudly holding the front door in place…this was going to be a tough day! Something made me wonder, so I called a great buddy of mine to bring over the appropriate cords and we plugged the Infra into the contractors generator and then ran some RCA’s from a boom box and …….wow…we didn’t even clean the Cumberland mud out of the RCA plugs. We loaded her up and I brought her 200 miles to the new home to meet my Genelec. I wired her in ……and I swear it sounded even BETTER, maybe even a little tighter, but even after all that time it was still just massive seamless low end…. this time I carefully shopvaced lightly around the cabinet, let a servpro fan hit it for 2 days and ….you got it…IT IS ROCKIN..it looks like hell, the bottom corner has started to split, but no rattles or cab shake. To honor its second rebirth I dug out my old Dire Straits favorite cut Heavy Fuel….. playing it thru my lap top with a couple of little krks… AMAZING….. Like our bass player says….. sounded so good I threw up right there!!!!! I will never buy another sub from anybody at any price, thanks for making such a remarkable product…USA! This is Greg Bennett, Owner of “Moon Dog Sound” here in central NY. We specialize in Mid size Sound Reinforcement events. I’ve been using Bag End TA15CF Wedge Monitors for over 7 years now. In all that time I’ve only had one 15″ driver go down. That is simply amazing. We do quite a few national acts every year and over those 7 years your monitors have worked well for all of them. My favorite combination is with an Audix OM6, it smokes. First of all, I have to tell you how incredibly happy I am with the TA1200 speakers that I purchased from you at the end of the NAMM show a few months back. As I told you, I am a saxophone/flute player and use them as speakers for my PA in small clubs, concerts, etc…. The response from them is so clean and flat, that it is a total joy to play through them. They are smaller and lighter than any speakers that I have owned previously, and they sound WAY better than anything I have owned. Finally I have found some speakers that give me back my true sound. I don’t have to spend my time and energy at the gig trying to get my sound right. THANK YOU THANK YOU THANK YOU. Also, I appreciate your taking me on as an artist to endorse your products. And you better believe I tell everyone how I feel about your speakers. I’m getting ready to record my new CD at the end of July. It’s a straight-ahead jazz quintet project that will include Steve Weingart (from the Dave Weckle band), Hussain Jiffry (From the Sergio Mendez Band), as well as Larry Williams and Jason Harnell. I would like to purchase a set of your studio monitors with the subwoofer that I heard at the NAMM show here in L.A. They sounded incredible and I really want to use them for this new project! Last night I went to the church where we have installed our latest system and I had a talk with the wife of the preacher who told me this. One of their members approached the pastor of the church Sunday after the service and asked him to look in his hand. The preacher asked what was in the man’s hand and the man stated that was his hearing aid. With a big grin the man said that he loved the new sound system and for the first time in years he could hear everything in the service and did not need to use his hearing aid. Needless to say, the church loves the system. This is a true story. I guess once again, we have proven that Bag End systems do remove waxy build up.